In an interview with Rpg Site, Square Enix game's director Kitase was asked a number of questions regarding the status of Final Fantasy's X|X-2, but amongst those questions and responses one section of the interview stuck out like a sore thumb. It was simply to do with the revival of previous instalments, most notably the infamous Final Fantasy XII. As quoted from the interview.. We might be one step closer to getting to see Vaan’s emaciated, whiny abs in glorious HD on PSP Vita and PS4. Prediction: Square denies this is true on Monday, then announces it on Wednesday. "We'll have to wait and see if these remasters are going to be successful, first," he explained. "If they do well, I think this will pave the way for more of the previous games to remade in an HD sort of quality. I mean, if we had to single out one of the vast number of Final Fantasy titles which we could make in HD, it would have to be Final Fantasy XII." This means is it leaves a door open for previous FInal Fantasy games to be remastered in stunning HD but only if the FFX/X/2 collection does well in sales. Now take it as you will but this is good news, especially for Final Fantasy fans and leaves more hope alive for ps1 Final Fantasy classics to see the light of day. 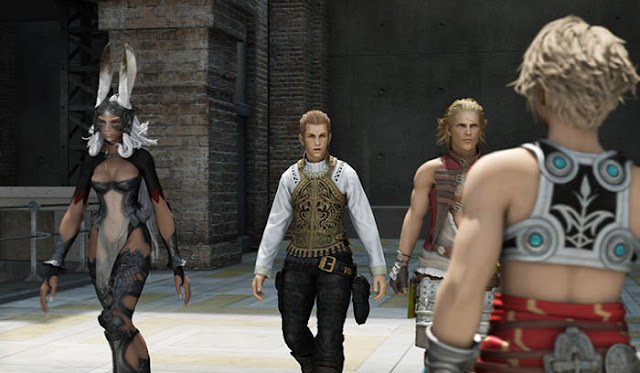 At a Final Fantasy Distant Worlds concert in Pittsburgh on Saturday, music composer Arnie Roth at random proclaimed that yes, Final Fantasy XII is receiving a remake, much to the surprise of fans'. Hitoshi Sakimoto who scored FFXII was also present. If this is real, it isn't exactly surprising as FFXII is the only Final Fantasy in the series which you can’t play on modern consoles, but it’s still great news for anyone who lost their chance to play the original or simply wants to replay the adventures of Vaan and party. Let's not jump our guns just yet though as Roth could be inaccurate or misinformed but he sure does sound positive about it via ia Final Fantasy Network. It’s very strange for a composer to be making random announcements in this fashion. So there’s reason to be weary, but RPG fans didn't need a crystal ball to see that a FFXII remake would be on the horizon after the prosperity of Final Fantasy X HD remaster on PS3. Update (6/6/2016): Final Fantasy XII: The Zodiac Age is coming to PS4! Square Enix have officially confirmed that "Final Fantasy XII: The Zodiac Age," a remake based on the 2007 Final Fantasy XII International Zodiac Job, is set to be released in 2017 and will include higher definition backgrounds, character models and cut scenes. So what else can we expect from Final Fantasy XII The Zodiac Age? Well for one it will feature an improved job system with additional levelling options. An auto-save feature, quicker loading times and a speed mode will also be included. Just like the FFX HD remaster for PlayStation 4, the soundtrack will be re-recorded with a choice to choose between the original score or remastered version from composer Hitoshi Sakimoto. You also have the option to switch between the English and Japanese voice actors. Trophies and share options for the PS4 will also be a new feature. My interest in purchasing X HD just went from -100 to 100000. If it weren't for insane SE sales expectations I'd take this as confirmation! It'll be nice to see at any rate. I would love a FF12 remake, especially on PS4, and especially at a budget price. Now we're talking! So if X | X-2 is a hit, would it be safe to say that XII HD would land on ps4? 1080p and 60fps, oh god, I would faint. 12 is cool but I would like to see an updated 9 with all new graphics or even a new FF in a similar style. Of course it'll never happen. FF is too much about hair and guns nowadays. FFXII is my favorite game of all time, cannot wait! They promised us FFXII HD after they finished FFX/X-2 HD. Its time for them to live up to their word. FFXII is the only game in the mainline series right now that hasn't been released on any other platform except for the one it originally released on. This must change. I've been waiting for a FFXII remaster/remake! Never did beat the original since I grinded so much early on in the game that I tired myself out and stopped playing. I regret it, but I hope to get back into it if Squenix really is creating a remake. FFXII wasn't my favourite FF. I didn't even complete it. Lost interest. But I'd love to give it another chance so I'm hoping this is true. I'm assuming that "remake" was lost in translation though. Pretty sure it will be a remaster. My favorite Final Fantasy, all I can say is if it's a "remake" they better not change a damn thing about the battle system. They should bring FFXII on steam! jrpgs on pc are making a resurgence and selling pretty damn well, so there's no loss. I knew that Square Enix would remaster FFXII, it was only a matter of time. I hope in time SE considers porting Final Fantasy XII: The Zodiac Age to pc like they did FF9. Well this is good news, final fantasy 12 is like my third favorite one in the series. What are your favorite FF games before XII?